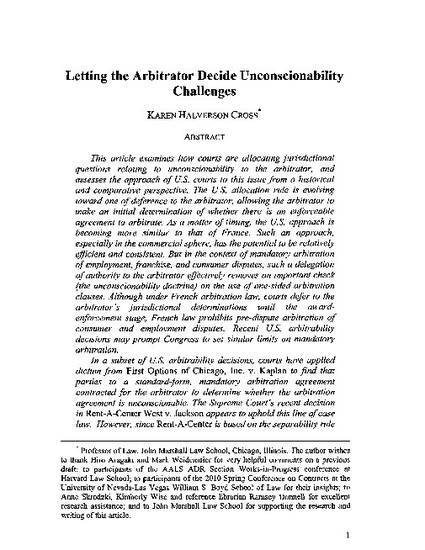 This article examines how courts are allocating jurisdictional questions relating to unconscionability to the arbitrator, and assesses the approach of U.S. courts to this issue from a historical and comparative perspective. The U.S. allocation rule is evolving toward one of deference to the arbitrator, allowing the arbitrator to make an initial determination of whether there is an enforceable agreement to arbitrate. As a matter of timing, the U.S. approach is becoming more similar to that of France. Such an approach, especially in the commercial sphere, has the potential to be relatively efficient and consistent. But in the context of mandatory arbitration of employment, franchise, and consumer disputes, such a delegation of authority to the arbitrator effectively removes an important check (the unconscionability doctrine) on the use of one-sided arbitration clauses. Although under French arbitration law, courts defer to the arbitrator's jurisdictional determinations until the awardenforcement stage, French law prohibits pre-dispute arbitration of consumer and employment disputes. Recent U.S. arbitrability decisions may prompt Congress to set similar limits on mandatory arbitration. In a subset of U.S. arbitrability decisions, courts have applied dictum from First Options of Chicago, Inc. v. Kaplan to find that parties to a standard-form, mandatory arbitration agreement contracted for the arbitrator to determine whether the arbitration agreement is unconscionable. The Supreme Court's recent decision in Rent-A-Center West v. Jackson appears to uphold this line of case law. However, since Rent-A-Center is based on the separability rule of Prima Paint v. Flood & Conklin Manufacturing Co., the decision leaves unresolved important questions regarding the scope and implications of the First Options dictum.